Why is the text on my iphone 6 disappearing after I use two dashes in a row? 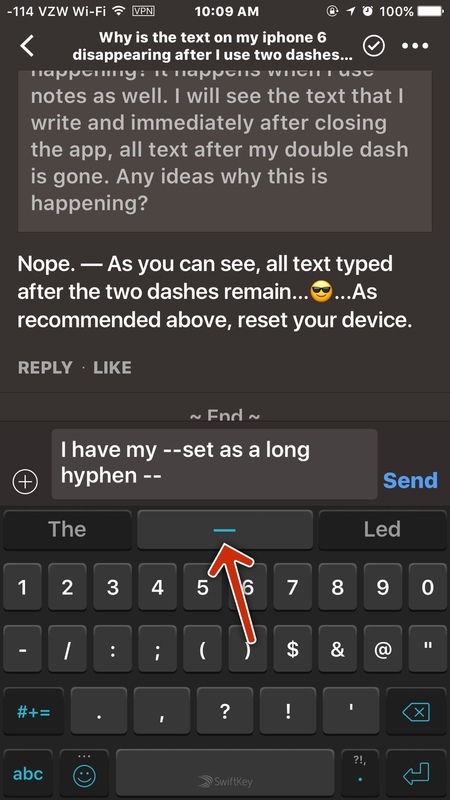 After updating to iOS 11, all text I write after using double dashes -- disappears for the person receiving my text or email. Any ideas why this is happening? It happens when I use notes as well. I will see the text that I write and immediately after closing the app, all text after my double dash is gone. Any ideas why this is happening? Re: Why is the text on my iphone 6 disappearing after I use two dashes in a row? Welcome to iMore! Have you tried a hard reset (reboot)? You might also try Reset All Settings. Nope. — As you can see, all text typed after the two dashes remain...[emoji41]...As recommended above, reset your device.